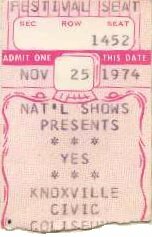 The November 25, 1974 concert in Knoxville was the first time I ever saw Yes. I grew up in the coal mining town of Harlan, Kentucky, and since I was a straight-A student my parents let me drive to the concert that Monday night (I had just turned 16). I know for most of the crowd the music was much different than what they were used to, especially the new stuff off of Relayer, which was great. I remember "To Be Over" being played with the background scene of an ocean or flowing water. My favorite piece was side four of Tales, Ritual or Nous Sommes Du Soleil. Alan White still had the drum set with the dragon over it, and with Jon playing different percussion type instruments during the song's drum solo I was truly mesmerized. I just made sure the kids who came with me were good and stoned, and everyone had a great time. 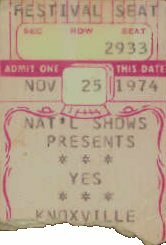 Believe me, people in the hollows of Kentucky and Tennessee were not your typical Yes fans, but still people came from all over to see the show. That concert influenced me more than any that I had ever seen, and reconfirmed my enjoyment of Yes music. Saw them in Knoxville, TN in the fall of '74 at the Civic Auditorium. Relayer had not been released, but the album cover was on/in the program. Gryphon was the backup.